You've heard of summer reading programs? When my kids were younger, we did a lot of them. One year we did programs at 3 different library systems in the DC area. Plus the one at Barnes and Noble and also through their elementary school. That was a busy reading summer. You think keeping track of library books from one library is hard? Triple it! Boy do I love borrowing ebooks from the library and reading them on my Kindle these days. Now that the kids are older, the summer reading program has morphed into a summer reading/cooking program. Once a week in the summer the kids are choosing a cookbook and fixing a recipe from it. They are welcome to search through my cookbook shelves, scan food blogs (I'm doing it, they may as well join me) or try our library. So far this summer we've had cake, grilled shrimp tacos, ice cream, and grilled chicken thighs. Now that I type that out, I can see a definite trend towards desserts and grilled meat. No wonder the fridge is bursting with vegetables! Good thing I'm also busy in the kitchen. Just a shout out here in praise of public libraries: when we move to a new home, like we tend to do every 3-4 years on average, one of our first stops is the local library. We're lucky here--our library is less than 3 blocks from home and carries an amazing selection in a lovely old building. Hooray for the Wright Memorial Public Library! It was during such a summer recipe search that the kids came across the Cake Mix Doctor® books by Anne Byrn. I love how there's a color photo of each cake at the beginning of the book and I can honestly say we've loved every cake we've made from her books. And this is an unsolicited/uncompensated review! 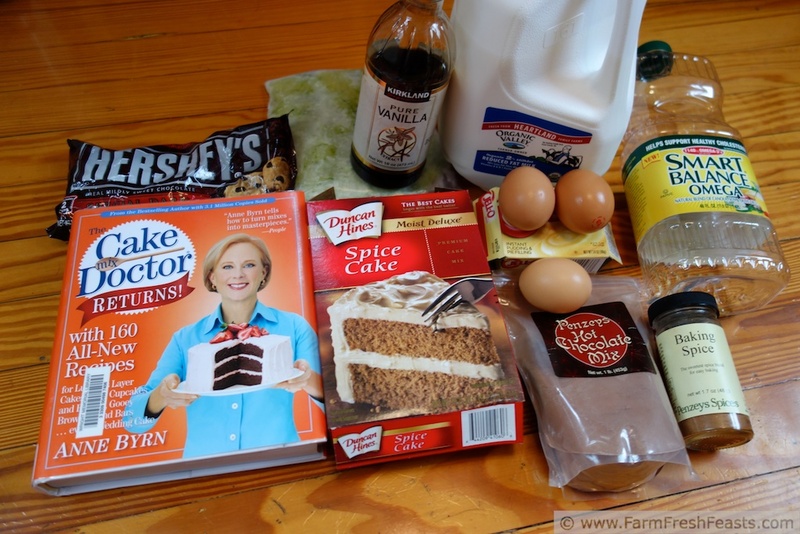 Making a Cake Mix Doctor® cake is about as easy as following the directions on the box--so, a good learning tool for my kids--but the result is so much better. It was with this idea in mind that I set out to the library one morning. I needed to bring a dessert, had seen this recipe, and had shredded zucchini (I put up my extra by shredding and freezing, for use year round) thawing on the counter. Tragically, I didn't have the key ingredients (namely, I was out of all purpose flour and unsweetened chocolate). While looking in the pantry for a box of cake flour, I came across a box of forgotten spice cake mix and remembered the Cake Mix Doctor®. Fifteen minutes later I was on the floor in the library with 3 Cake Mix Doctor® books spread open in front of me, debating the merits of 4 different cake recipes involving shredded zucchini. What's not to love about a library? I ended up checking out The Cake Mix Doctor Returns! by Anne Byrn, and adapting her Chocolate Chip Zucchini Cake recipe based on what I had on hand. The folks at work, as well as my family, agreed it was delicious. For other recipes using zucchini, please see my Zucchini Recipes Collection, part of the Visual Recipe Index by Ingredient. I've got a Pinterest board all about squash, you can follow it here. Wanna know How to Use This Blog? Click here. adapted from The Cake Mix Doctor Returns! Spray a Bundt pan and shake some hot chocolate mix into the pan for dusting (I was out of flour, remember?). Tilt the pan to get the hot chocolate mix all over the pan, then dump out the excess. In a large bowl (my stand mixer) dump all the ingredients except zucchini, chocolate chips, and confectioner's sugar. Mix on low speed until the ingredients are combined. Stop and scrape the bowl, then continue on medium speed for another 1 1/2 minutes longer. Use the same scraper (spatula? My kids give me such grief over the proper terminology) to fold in the zucchini and chocolate chips. Pour the batter into the prepared pan. Bake for 50 minutes until the top springs back when you press it, then set the pan on a wire rack to cool for another 15 minutes. 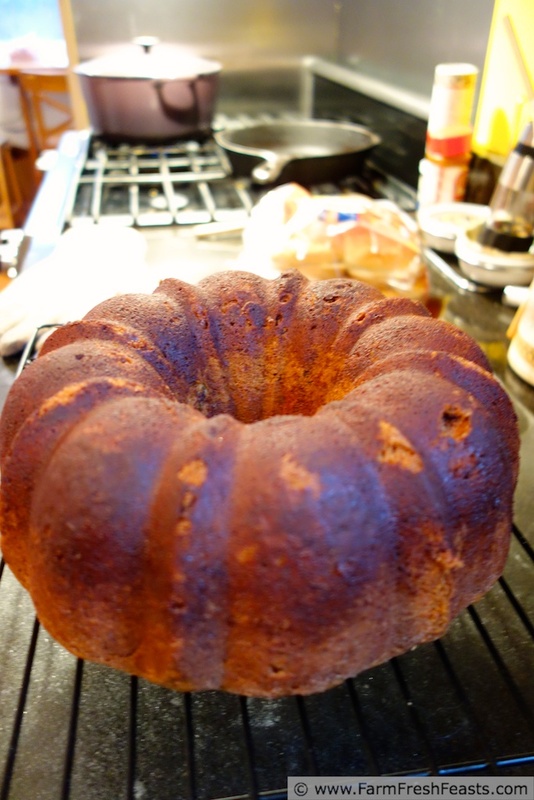 Flip the pan over onto the rack, and leave it alone for a minute to loosen the cake from the pan. Remove the pan and let the cake cool completely. Transfer to a large plate and have your daughter dust with confectioner's sugar. Do you participate in a summer reading program? Do you deliberately read outside your favorite genre? As soon as the book arrives, I'll be participating in the Summer Book Club on HOMEGROWN.org and reading Cooked: A Natural History of Transformation . This post is shared with the Wednesday Fresh Foods Link Up, What's Cookin' Wednesday, the From The Farm Blog Hop, What I am Eating, What's In The Box, the Clever Chicks Blog Hop, and Tasty Tuesdays. Getting cookbooks from the library is such a great idea, but I never remember to, so I need to start checking them out! Also, a little fun fact is that Anne Byrn goes to our church and she is friends with my mom! This sounds like such a great recipe to choose from her, especially with the summer zucchini! A Brush with Greatness! How cool to have your mom's friend be a talented author! I really enjoy her books. We love the library! They have summer reading clubs for all ages and we are all participating. Our son volunteers there once a week, to help register kids as they reach the next level in the club. He loves giving out the prizes! 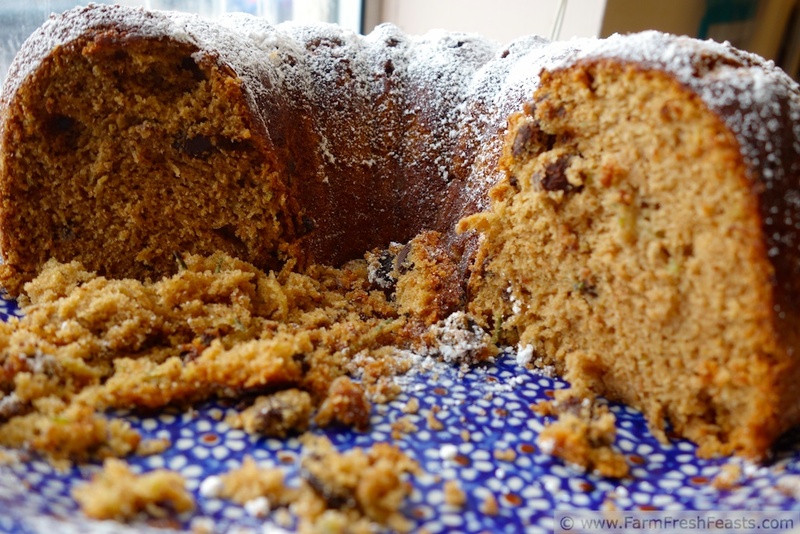 And I love zucchini spice cake! Sounds like your chocolate made the perfect addition! I have made many a recipe to use up dribs and drabs of chocolate chips and other baking goodies. I am going to borrow your idea for getting the kids into the kitchen. Thanks for the inspiration! I'm glad to hear of all ages summer reading clubs--that's pretty cool--and what a wonderful activity for your son! Let me know how it goes getting him into the kitchen. I don't know why I don't utilize the library more often. I am such a spur of the moment kind of cook, so not sure it would ever work for me. But I can tell you your cake is absolutely deliciously inspiring. I'm glad to inspire. I admit I use the library more now that I can walk over in a few minutes--that's such a treat. It's overwhelming to think of searching something on the internets--too vast at times, if you don't have the time to winnow down your search. Pass me a slice? That looks amazing. I love using shredded zucchini (and summer squash) in baked goods -- it makes them so perfectly moist. Shredded vegetables sure make baked goods moist--and when I'm overwhelmed with all the veggies it's nice to stash them in anything that works. I used to be a library junkie, but I have a Kindle now and I'm on my family's account which means I can read all the books they purchase. Basically, I have my own personal library, except there's never time to read anymore; a very sad thing indeed. When I am reading, 92.67% of the time, it's blogs while my book (Kindle) gathers dust in the corner. I think having your kids cook a meal once a week is a brilliant idea, and they are always welcome to come practice in Cleveland. It might be good for them to try making vegetarian meals anyway (ignoring the fact half their meals were vegetarian). Tell me more about freezing shredded zucchini, and how do you get all the water out? I try and try and it's never enough (is that dramatic enough for you?). Cake and ice cream don't count as vegetarian meals in my book! They are eating more vegetarian meals this summer, so that's a start. Speaking of books--Ohio eBook Project. I have a thing against paying for books, a thing my spouse does not share, but I can borrow books on my Kindle using my library card, thanks to the Ohio eBook Project. See if your library participates. You never have to remember to swing by the library to return an electronic book . . . When you freeze shredded zucchini (I measure out 1 cup portions of finely shredded zucchini into bags, smush them flat, and freeze) you don't need to remove the water first. The very act of freezing breaks down the cell walls of the plant, releasing the water, so when you thaw it you can just squeeze the bag until it's dry. Easy peasy. Harder to do with non-frozen zucchini, but then non-frozen zucchini has better structure in whatever you want zucchini structure for . . . I'm digging a deep hole here. Just don't worry about squeezing before freezing. Thanks!! Much appreciated. No squeezing before freezing. I like that. I'll add a shout-out to our town libraries. The libraries (and, for some reason, the produce section of one particular local grocery store) are the crossroads where you meet everybody in town, join book groups, rent videos (and cake pans! ), and attend events. Where would we be without them? Renting cake pans--that's a great idea! My local library will forever remain in my heart for staying open later on the weekend after last year's derecho. There was spotty power outages (our side of the street was out for 4 days, across the street never flickered) and the library was a source of phone and laptop charging, wifi, and AC for anyone who needed it, staying open past normal closing hours as a cooling station. Much appreciated. I like how your libraries really are community centers. Love the use of vegetables when cooking with sweets..I'm still yet to do it but looking forward and encouraged by your use of zucchini and chocolate. It's really more about making use of the veggies in the farm share box than anything else, but I've found veggies go deliciously well in a surprising number of desserts. And my kids, skeptical when I tell them what's in it, take a taste and agree. My, oh my does that look delicious! Thanks--the pictures were the best I could do at work--though you'd think being a thrift shop I could have styled it all up with access to all those props. Hmm, something to think about in the new place. 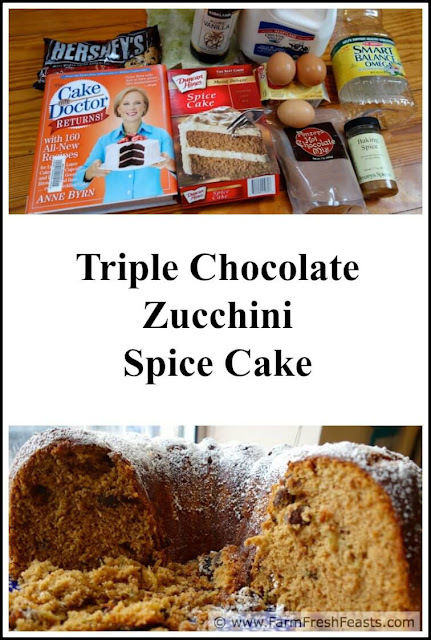 What a perfect time to have your Triple Chip Zucchini Spice cake on your blog. Here in New England zucchini is just starting to produce and this recipe looks mouthwatering. I can't wait to try it. Thanks! Sometimes it's very difficult trying to decide when to put up a recipe--when I'm making it, using my put up veggies, or when the veggies are ripe and in season. Or, as in the case of my Green Tomato Bacon Jam, when you'd be heartily sick of the veggie and looking for a new way to eat it (that will be coming in September). Our summer reading program began today, and all three kids have been reading. I tend to stick to reading the same type of book but will try something new if someone I know highly recommends it. My spouse and I have been reading books-turned-into-movies and that, coupled with my book group, has exposed me to a wider variety of genres than I usually prefer. I'm glad to broaden my horizons.